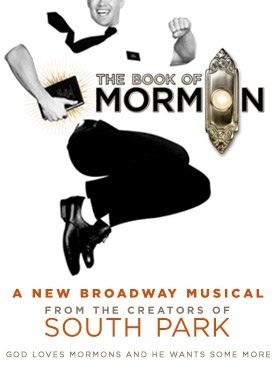 The best thing about the new musical The Book of Mormon is that it is at the same time shocking and familiar. It is difficult to think of another instance where a musical so blatantly laughs in the face of religion—a topic best avoided in any social setting—and holds nothing back in terms of profanity and sexual humor. Yet even so, The Book of Mormon, while setting these precedents, is a beautifully constructed Broadway musical in a very traditional sense. Written by South Park creators Trey Parker and Matt Stone, the duo has made very public over the years their reverence of musical theater. Collaborating with Robert Lopez, co-writer of the Tony-winning Avenue Q, this musical-loving team has done the medium justice. With a story that follows two young Mormon missionaries to Uganda to spread the word of their faith, character traits and ambitions are established immediately and simply. Elder Price (Andrew Rannells) is a handsome, perfect Mormon disciple, determined to rise the ranks in the Church of Latter-Day Saints. Elder Cunningham (Josh Gad) is a goofy, clueless loudmouth who just wants to make a friend and prove his worth to his parents. Audience, we have our newest Broadway odd couple! Elder McKinley’s simplistic instructions for suppressing “sinful” desires is among the best of the show’s fantastic musical numbers. “Turn It Off” gets the entire Mormon mission together, each singing about burying his own unpleasant temptation without the struggle of truly facing it. Each elder presents his own issue (each becoming more hilarious) and flippantly casts it off as solved. Grief over the death of a loved one? Turn it off like a light switch! While Lopez’s lyrics were genius in Avenue Q, his melodies lacked hook. His collaboration with Parker and Stone have filled that gap. The opening number, “Hello,” has a bouncy rhythm, and excellently staged by co-directors Casey Nicholaw and Parker, serves as a superb kickoff to the show. Another of the show’s best musical offerings is “You And Me (But Mostly Me),” Elder Price’s showcase of great ambition and also intense ego. With a dramatic, sweeping melody, the song and it’s subject matter seemed like a hilarious sendup to Stephen Schwartz’s “The Wizard and I” from Wicked. Adding to that song is Rannells’ fantastic performance. Strikingly good looking, he portrays Elder Price as an all-American Mormon who probably fancies himself as the next coming of Joseph Smith, the founder of the Church of Latter-Day Saints. His Elder Price is good intentioned, but sinisterly pompous. He wants things to be perfect, and when his assigned mission location turns out to be Uganda, rather than his ideal placement of Orlando, Florida, his reaction is nothing short of hilarious. Gad is the perfect counterpart to a performer like Rannells. Gad is an actor who uses every bit of his characterized physicality (overweight, curly black hair, wide mouth) and plays those traits like a grand piano. His large, rubbery facial expressions and big eyes are able to convey the giddiness of a 12-year-old at Disney World. Gad is able to manipulate his voice into an irritating rasp and project it throughout the theater (I say manipulate, because Gad actually has a beautiful singing voice). As Elder Price and Elder Cunningham, these Mormon misfits show tremendous growth over the course of the show, and that is what makes Book of Mormon worth while. They arrive—not in Orlando—but in a poverty and violence-stricken land where faith is nowhere to be found and a frightening general mutilates women. When given the seemingly impossible task of making the villagers believe in something, Elder Price and Elder Cunningham break out of their respective character constraints and perform a miracle. For those that see Book of Mormon (or judge from afar) and view it as a defamation of religion, consider otherwise. For being such a brash, expletive-ridden piece, Book of Mormon offers a very sweet position on faith, that no matter what one believes in, it is important to believe in something. 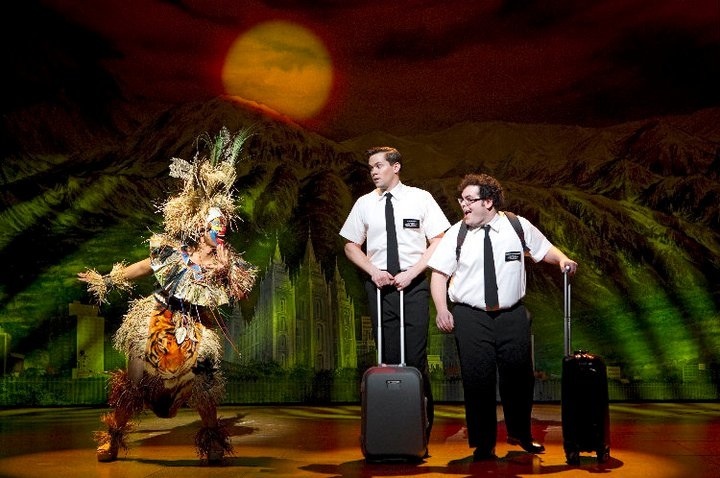 While boasting incredibly tight production numbers and solid writing, Book of Mormon shows signs of weakness in the development of its supporting characters. O’Malley, who is a superb showcase of flamboyance and insanity as Elder McKinley, could have used more integration into the main plot. Nikki M. James is touching as the gullible and sincere Nabulungi, but the character’s writing remains two dimensional. Nabulungi’s father Mafala Hatimbi (Michael Potts) is introduced and then underused. While the two heroes are excellently developed and understood by the audience, we don’t know nearly as much about the community they become a part of—which is equally as important to this story. Broadway is a risky business, especially these days. I respect shows that take risks, but do so intelligently. Spider-Man: Turn Off The Dark took risks without thinking about them; The Book of Mormon did it with calculated, well-planned moves. Let’s give the smart guys the credit; these Mormons aren’t as dumb as they look. Two hours prior to the performance, entries will be taken for the lottery. Players may enter for up to to two tickets for $32 each. A half hour later, names will be drawn. Follow Stage Rush on Facebook and Twitter for on-the-go updates and sign up for the weekly newsletter! Great review. I’m excited to see it and ecstatic that it is recieving such glowing reviews today. Great review!!! I hate that the rush policy is lottery but I am going to try for tickets next week or the week after. Wish me luck! Great observation on this show taking well-planned risks as compared to the thoughtless planning of Spiderman. I was fortunate to hear about this before it opened and got tickets. Absolutely loved it! It was the bedt of the four shows I saw during a week in New York.